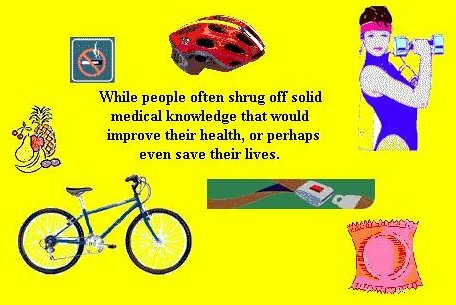 "Health Knowledge is Health Power." Never has so much information, particularly health information, been available via the media. It spews from televisions and radios, and now computers, around the clock and around the year. Newspapers publish special sections on health; and entire magazines devote themselves to the subject. "Surgeons at City Hospital are trying a new type of procedure they hope will help some patients with a certain heart condition." Many health reports are irrelevant to most people. Other reports are speculative. "Researchers say a protein found in certain cancer cells may lead to the development of new tests or treatments." After spending more than 20 years reporting news, including more than a decade specializing in health and medical information, it's natural for me to wonder about the effect of news reports and other mass media information. Jump to papers, publications and other products of my research. So I'm delving into the enigmatic relationships between knowledge and behavior. When, how and why does information motivate action? Case in point: teen smoking. It looks like smoking is cool again. Smoking rates among teens are rising. which campaigns are just "feel-good" efforts, with no discernible lasting effect? and which messages may actually make smoking more attractive to teens who want to act "grown-up?" With the support of a Kaiser Media Fellowship in Health I am investigating these questions. My aim is to produce a critical analysis of media campaigns and other information-based efforts to prevent teens from smoking. I will also be considering the limitations of even well designed information campaigns. Especially when dealing with an addictive substance such as nicotine, knowledge and persuasion may not suffice to change behavior. Such a limitation was recognized years ago by researchers attempting to reduce the toll of motor vehicle crashes. They realized that the focus on education, teaching people to be "good drivers," would never prevent every crash; people will always make mistakes behind the wheel. So rather than laboring just to change driving behavior, experts shifted their attention to changing the "driving environment." Cars were redesigned to include crumple zones, seat and shoulder belts, and other safety features. Roads were straightened, dangerous intersections rerouted, shock-absorbing barriers installed at freeways exits, bridge pylons, and other obstructions. This paradigm shift led to a substantial and sustained decline in motor vehicle death and injury rates. It may be that a portion of the money and other resources earmarked for anti-tobacco education campaigns would be better directed toward alternate strategies. I will be considering the relationship and relative priority of informational campaigns vis-a-vis other tobacco prevention and control tactics. Simply put, there is no other matter in which a change in behavior would have as dramatic an effect on public health. As a leading cancer researcher put it, when he opened a briefing session at the meeting of the American Society of Clinical Oncology: "There's a lot of exciting research being presented here, but I would trade it all for an end to smoking."